Choose inspiring and beautiful Addison County, Vermont, for your next meeting and you might never want to leave. But when you do, you'll take along some fresh, new ideas inspired by our spectacular scenery, friendly people and crisp mountain air. Get away from the office to discuss new strategies or develop a new approach. Reward your company's top thinkers, planners or producers. Whatever your intention, a meeting in one of Vermont's most scenic regions will certainly be one to remember. From cozy bed and breakfasts to modern suite hotels, Addison County, Vermont, offers dozens of options for your planning session, management meeting or incentive trip. 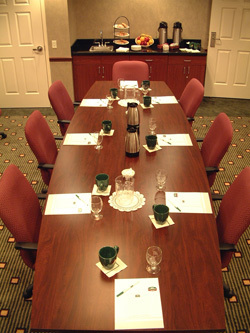 Area facilities can host small groups up to a meeting of 200 attendees. Addison County, Vermont, is within an easy drive of Burlington International Airport and Albany International Airport.